'Britain on alert for new super-flu: Killer virus could spread in 24 hours', it screamed. A new strain of killer flu which could spread to Britain within 24 hours is “one of the biggest biological threats of our time”, experts warned. The alert comes after people started to fall victim to seasonal flu and the more virulent swine flu at the same time. The Mail followed it up with the article 'Fears of new deadly super-flu which 'could spread to Britain within 24 hours''. 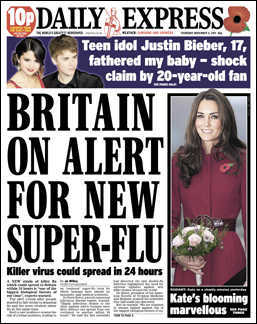 The 'could' is important because the 'deadly' 'new super-flu' - which Britain is 'on alert for' - isn't known to exist. Secondly, the people who have 'started to fall victim' to seasonal and swine flu at the same time, are two people who fell victim in 2009. The research the news was based on was actually a small, but important study that had examined a Cambodian patient who became unwell during the swine flu pandemic of 2009. Examining the man and four of his contacts, scientists determined that two of the five subjects were infected with both swine flu and a seasonal flu virus that was circulating in the environment at that time. None of the five infected individuals required hospitalisation and all made a full recovery. So what of the Express' front page headline? Although news coverage has reflected the findings of this study accurately and quoted flu experts, the overall emphasis of reports has been misleading and alarmist. Their headlines suggest that a “deadly super flu” has been found and is ready to spread to the UK...[but] these are laboratory findings from five people infected in 2009 with swine flu and/or seasonal flu. None had severe illness or required hospitalisation, and none died from a ‘deadly new super-flu’. When a real "Super-Flu" rears it's ugly head nobody will give a toss. It's the tabloid equivalent of crying wolf. Actually - you could extend the "not giving a toss" part to covering everything about the Daily Express whatsoever. Every time I look at those rags the Excess and the Daily Stir, and, sadly nowadays Channel Five and its satellites, I keep seeing only the tarnish and smutch of Richard Desmond's heavy hand all over everything, besmirching whatever he touches as if covered in a smear, a thin layer of dirty old machine oil. And the word verification - exeschit - says it all. We're all doomed, doomed I tell ye. I want to know who Jo Willey is. There's no biog on journalisted.com (where her earliest web appearance can be found, dated 2004), in fact, not much anywhere beyond blogs like this to be Googled. Obviously, like St Ben Goldacre, she is fully qualified to write about what she knows.